The toughest ice plant yet – Alan’s Apricot! With their neat habit and ability to suppress weeds, hardy South African ice plants make ideal small-scale groundcovers. Alan’s Apricot ice plant is no exception with its superior cold-hardiness and long bloom season. More adaptable to a wider range of conditions that all of our other ice plant selections, Alan’s Apricot was brought to Plant Select® by Alan Tower, of Tower Perennial Gardens in Spokane, WA. Alan saw a need for more drought tolerant plants in Spokane, where they can go months with no rainfall. It is so bad that, for a period of three months, they are drier than the desert in Utah, Colorado, New Mexico and Arizona. Gardeners give up because of the heat and drought. Alan decided to develop an ice plant that was not only drought tolerant, but exceptionally cold-hardy as well. 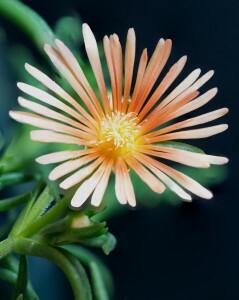 The narrow green succulent leaves and stems are topped with 2″ large orangey-apricot blooms from spring through early fall. The bright yellow centers glow and invite pollinators to partake of their sweet nectar. As the temperatures cool, the luminescent flower petals fade to a pale apricot-pink. The soft hues of the flower compliment darker colors in the garden and go especially well with burgundy foliage of sedum, sempervivum or barberry. It is also stunning when combined with the blue foliage of little bluestem or blue fescue. It’s useful in containers, in rock gardens and for planting near rock walls or edging. Plant it near a small boulder so its evergreen foliage can climb and clamber over and about the sides. Once established, Alan’s Apricot ice plant requires virtually no care. Thanks to Carla Tews of Plant Select® for this piece. Not sure about availability this late in the season, but it’s been fairly available this spring and summer. Which delosperma is the one that turns red (not orange) in winter (located in the African Plaza at DBG)? That is the red winter color of Delosperma nubigenum. The hardy yellow ice plant is spectacular!